Faience is the raw material for the manufacture of countless objects, including in the Late Period huge numbers of shabtis and amulets. Faience was primarily valued for its symbolism. It was regarded as a manifestation of light. The Egyptian word for faience, 'tjehenet', means 'that which shines'. Faience goes into the kilns as dull and colourless, but comes out brightly coloured and shiny. The Egyptians connected this with the resurrection of the sun from the dead and with the light which was so essential for the deceased in his tomb. The bright green colour was also connected with regeneration. It is therefore easy to see why the dead were given so many faience objects. In the chambers under the Step Pyramid of Djoser at Saqqara, for example, and in the so-called Southern Tomb belonging to the same complex, thousands of faience tiles have been found, organized in such a way that they were presumably meant to be a depiction of reed marshes. Faience objects have been found from as early as the late Predynastic Period and the Archaic Period (1st and 2nd Dynasties), mainly beads, tiles and small votive objects. Faience objects continued to be produced in the centuries to follow. The majority of the objects found date from the New Kingdom, and especially from the Late Period. Faience consists for more than 90% of silica, which is found in sand and crushed quartzite. An alkali was then added, such as natron, as well as some lime and a colouring agent, usually crushed copper. 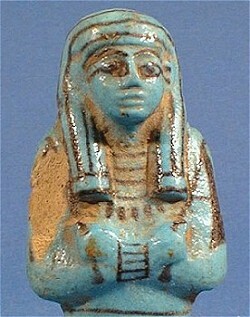 The latter gives faience its typical blue-green colour. Water was added to form a paste that could be modelled with the hand, or pushed into a mould. Before the object was fired it could be decorated either with black paint or by carving patterns into it. It was also possible to add inlays of another faience which fired a different colour.